Regular professional kitchen cleaning is essential for the safe and hygienic operation of every commercial kitchen. We offer the best complete deep cleaning services to restaurants and commercial kitchens in Trinidad and Tobago. A regularly maintained kitchen exhaust system ensures that the air is kept clean and fresh. It is also extremely important in fighting the likelihood of kitchen fires. Our expert team is properly trained, certified, insured, and extremely professional. We are experienced in cleaning a wide range of kitchens to our customer’s highest standards. We use only the highest-grade chemicals, professional equipment and cleaning methods. Installing access panels to ensure we are able to scrape clean your system from top to bottom. Cleaning all of installed fans, ducts, hoods and accessories of the system. Cleaning and polishing of equipment. Degreasing and cleaning of walls and floors throughout the kitchen. After time, your canopy becomes full of oil buildup, fat and grease. It is constantly exposed to smoke, oils, grease, chemical particles and odors. It is important to have it thoroughly cleaned. We ensure that both inside and out of the canopy as well as the filters are professionally cleaned and all of the oil and grease deposits are removed. This ensures the optimal effectiveness and the appearance of the canopy. In addition, we polish the exterior leaving it looking great. We will provide all of our customers a Certificate of Cleaning detailing the service provided. Your exhaust fan is vital for the smooth and effective operation of the system. The fan initiates and facilitates the extraction of the contaminated air from your kitchen. Proper and regular cleanings allow the smooth running of the fan and optimal working of the entire system. If unmaintained, fans can quickly become clogged with grease. This can have a damaging effect on the fan causing strain on the motor. If this is allowed to happen the consequences can be expensive repairs or replacement of the fan. It is often what you cannot see that is most dangerous. We ensure that all ducts are properly degreased and steam cleaned using our specialized chemicals and equipment. All of the components of the ventilation system work together to keep the air in the kitchen clean and safe. Grime and oil can build up rapidly in the ducts and need to be cleaned regularly. This will prevent the contaminated air staying in the kitchen and affecting your staff and can also prevent fires, as unmaintained ducts are a major fire risk. We provide a complete duct cleaning service using our specialized equipment, which includes a detailed cleaning of the ducts and repairs to any leaks that might have developed in the ducting. We will prepare a customized cleaning schedule tailored to your restaurant. Each restaurant is different and we will provide recommendations on individual systems. The frequency of the services will depend on your kitchen and the type of food being prepared. After more than 10 years of servicing more than 80 restaurants throughout Trinidad, we have cleaned and repaired many different sizes and types of restaurant equipment. We have also developed relationships with suppliers of equipment and parts both locally and abroad. 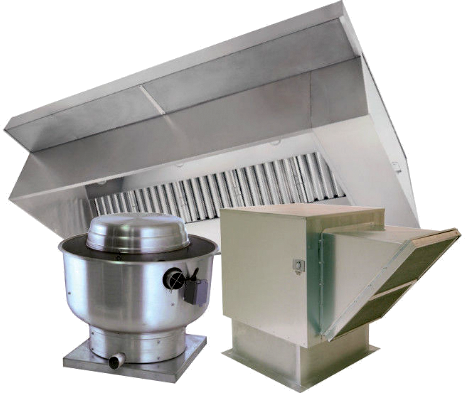 We supply parts for existing units or recommend, source, supply and install new units including hoods, filters, ducting, and fans as well as any other kitchen equipment. Kitchen filters are the first line of defense against the unsightly and dangerous build up of oil and grease. Restaurants should not have to be inconvenienced with the process of cleaning your filters. 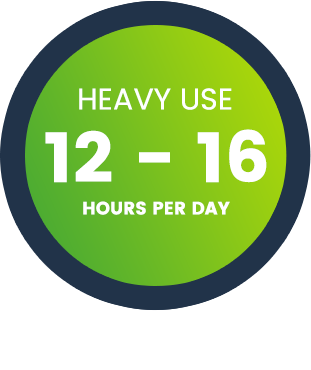 To address this, True Green Industries is happy to offer regular filter exchange and cleaning. You can either opt to purchase your own set of filters that are tagged and stored ensuring you get your filters with every service or use an exchange set of filters from our stock pool. These filters are guaranteed to be of a good quality. 2. Implementing a cleaning schedule. Each restaurant is different and requires a tailor made filter cleaning schedule. We will work with each customer to create a cleaning schedule to address your individual needs. True Green Industries will ensure that the filter exchange is performed by only qualified and trained employees. We will also ensure that the workspace is left in the same condition as when we arrive on site to do the exchange. As stated above, each restaurant is different and will have individual needs depending on a variety of different circumstances. We have attached a general guide as to the frequency of cleaning dependent on the use in the kitchen. Grease deposits in extractor hoods and exhaust air ducts of commercial kitchens cause high cleaning costs, severe odour nuisances and increased fire hazards. 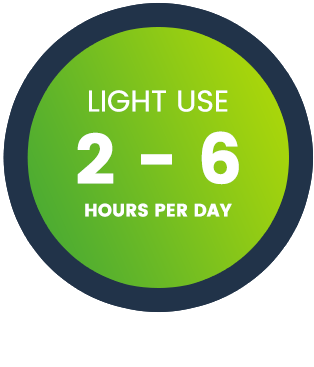 Treatment with high-energy UV radiation photolysis, destroys and neutralises the molecules of greases and odours. This keeps the surface of the extractor hood clean and substantially facilitates the cleaning of the exhaust air duct. Where daily cleaning by hand was required before, the exhaust air duct now needs almost no manual cleaning at all. 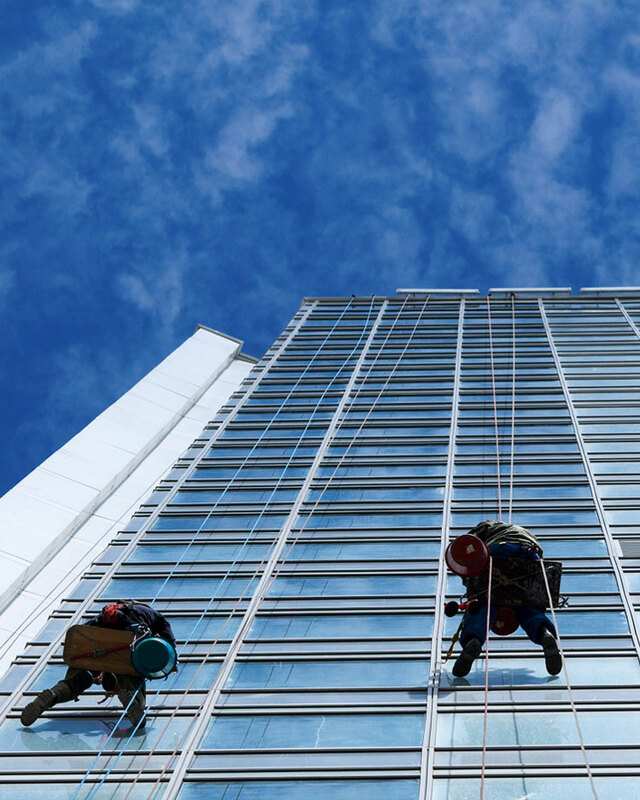 True Green Industries is a leading Building Maintenance Company in Trinidad and Tobago that embodies values such as integrity, trust, dependability and support to all of our clients. Our experience in the following areas has exposed us to the highest standards of work that are required and monitored by the state and the private sector. True Green Industries have been invited to and carried out specific closed tender projects in the Public Sector and have completed projects for Central Bank. Nipdec, T&TEC, the Trinidad and Tobago Coast Guard and Ministry of National Security. Our private sector jobs include Queen’s Hall, Massy Technologies, Nicholas Tower, and Nagico Insurance. True Green Industries is a fully licensed, insured and VAT registered company. Our team now includes project managers and engineers and wide range of skilled and non-skilled labourers. Free consultation with informative, cost effective solutions. Free on-site demos to show what we can offer you, first hand. Local references of jobs done. Recent photos of work that we have completed for satisfied customers. Site Visit: We will arrange a site visit with you and recommend the equipment necessary for you to perform your job. Supplying equipment: Once the site visit is done and the equipment is decided upon, we can order and transport the equipment to the intended work site. Erection of Equipment: Our trained and experienced personnel will erect the suspended platform and supporting arms in a safe manner. Inspection: We will make arrangements with certified inspectors to visit and inspect the platform. They will then provide the required inspection certificate. 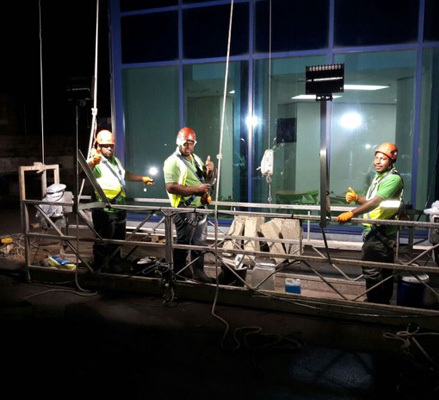 Personnel on site: True Green Industries will provide personnel on site when the suspended platform needs to be moved and will be on call to deal with any situation or emergency. If requested by the customer, we can provide personnel on site at all times. Breaking down of Equipment: After the job is completed, True Green Industries will break down the equipment and have it returned in a timely manner. 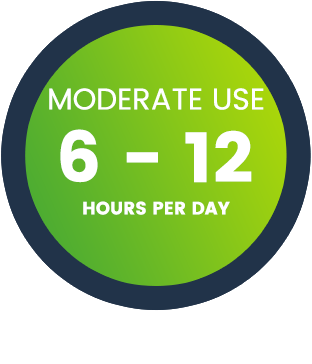 The tap water that is traditionally used for window washing contains trace amounts of minerals. While this is ideal for drinking, it is these same minerals that lead to streaks and residue when cleaning your windows—or even your car. When water is deionised, these minerals are removed, ensuring a streak-free shine. Our water purification system eliminates the use of squeegees on glass which cuts the cleaning time and gives instantly better results. Whether it be commercial or residential, we offer professional hot and cold pressure washing services at 200 degrees fahrenheit @ 3000/3500/4000 psi. 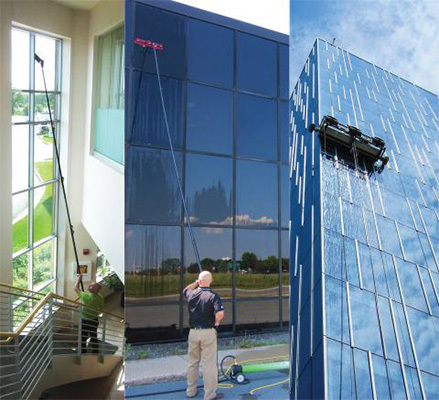 For more information on Commercial works, please look at High and low building exterior cleaning and maintenance. The outside of your home is constantly exposed to harsh elements. These elements attack the surfaces of your home causing them to degrade, discolor, oxidize, or chalk overtime. As a result your property will lose value and it won’t look as good as it could. Some of the most harmful natural elements include ultraviolet light rays, wind, rain, dirt, and grime. Other than the elements, insects, birds, spiders, wild winds, mold, mildew, and tree sap can also leave their mark on your house. There are also man-made marks that appear as a result of pollutions, car exhaust, acid rain, and even smoke from your barbeque. You will notice over time, if you haven’t power washed your house before, that these natural and man-made materials will accumulate and make your house look run down and in need of some TLC. If you leave it too long, you can destroy the long-term beauty of your property dramatically, resulting in the loss of value on your home. power washing will definitely increase interest and make great first impressions. Your house will look very attractive without any mildew and mold, which would possibly increase the number of people putting in offers. Saving Money: Power washing is smart preventative maintenance. Regular exterior surface cleaning and can prevent costly repairs to your property. Furthermore, power washing is one of the least expensive cleaning tools for large surfaces such as your home’s exterior. Preventing Permanent Damage: Letting stain and grime sit on your home for very long periods can result in permanent damage. Power washing can remove this grime quickly and easily with little impact on the environment, when compared with traditional cleaning solutions. Saving Time: Using a pressure washing service saves valuable time by not having to mix cleaning solutions, climb ladders, do strenuous activity, or scrub surfaces. Washing by hand or scrubbing the surfaces could take hours to get a fraction of the results. Removing Allergens: Homeowners can actually reduce the level of allergens in and around their home by pressure washing the exterior of their home. This can help you and your family live a bit more peacefully without coughing, sneezing and watery eyes. Preparing Surfaces: Whether you’re thinking about re-staining your deck, painting your home, or refinishing your pool, pressure washing will prepare the surface better than any other cleaning process or solution.